Punt, Pass & Pork: Lessons, questions from first College Football Playoff season; more analysis after rivalry week. "Whenever my league's presidents have asked me about the positives and negatives of a playoff, I tell them the two positives are money and people will stop yelling and screaming. And the negative is the value and meaning of the regular season will be diminished. Playoff proponents who say that's not true -- that's just pure stupidity." Hopefully Tranghese -- now the former Big East commissioner and a member of the College Football Playoff selection committee -- is better at picking teams than he is at predicting the future. Tranghese was stupendously, hilariously wrong when he said the above quote in 2008. If anything, the playoff has made sports' best regular season even more exciting. By increasing the number of teams that will get a shot to play for the national title from two to four, the playoff has increased the number of relevant games. Take Saturday's Georgia Tech-Georgia thriller, for example. Even that game, which in the BCS era would have mattered only to fans of the schools involved, might have had playoff implications. Obviously, Georgia Tech would still need to beat undefeated Florida State in Saturday's ACC championship and then hope for chaos throughout the rest of the country. But when Yellow Jackets kicker Harrison Butker drilled a 53-yard field goal as time expired to send the game to overtime, hope remained alive. There is a number for the playoff that would cheapen said hope, but four isn’t it. It's small enough to make the playoff exclusive, but large enough to allow more fan bases to live and die with each field goal and fumble. (Eight is also probably a small enough number for exclusivity, but any more is pushing it.) So, now that all the Power Five leagues except the Big 12 have completed a regular season in the playoff system, what do we know? What do we still need to learn? • The butterfly effect is even bigger now. Missouri and West Virginia losing on Championship Saturday of the 2007 season to put LSU and Ohio State into the BCS title game made for the most chaotic weekend of the previous era. Let's assume Alabama, Oregon, Florida State and TCU comprise the selection committee's top four this week. It's not likely, but it is possible that all four teams could still change. Alabama could lose to Missouri in the SEC title game. Oregon could lose to Arizona for the second time this fall. Florida State could lose to Georgia Tech. And if Baylor beats Kansas State, the committee may decide that the Bears' head-to-head win over TCU and subsequent Big 12 title trump TCU's superior schedule and better loss. Baylor, Arizona, Ohio State, Wisconsin and Georgia Tech all remain theoretically alive for playoff spots. Every Power Five league will have at least one game relevant to the national title picture on championship weekend. • The committee's weekly rankings probably create an unnecessary confirmation bias, but they have served their intended purpose. Major college football is a massive, lucrative business. The committee meets weekly to create rankings beginning in late October because ESPN pays an embarrassing sum to televise the playoff, and ESPN wants a weekly television show in which rankings are revealed. I assumed this would drive conversation a little, but I have been shocked at how much the committee's rankings are rehashed and debated by fans. They want you engaged, because that makes you more likely to watch. That allows the cable networks to eventually command higher monthly subscriber fees, which allows the conferences to make even more money either through their conference networks or on their next media rights deals. You are engaged. That means ka-ching for ESPN and for the schools. The committee has made this point clear by keeping TCU ranked above Baylor and by dropping Florida State behind two one-loss teams. The Seminoles aren't to blame here. A nonconference schedule featuring Oklahoma State, Notre Dame* and Florida would be positively brutal in a lot of seasons. This just isn't one of them, and the committee can only work with the résumés posted this year. Baylor, meanwhile, has no such excuse. The Bears intended to schedule three easy wins, and that's what they got: three easy wins that seem to matter not one bit to the committee. If the committee remains consistent on this topic in its final ranking on Sunday, it will likely encourage teams to schedule better out-of-conference games. That would give us better regular-season games to watch in the future. *The ACC requires that five of its schools play Notre Dame each season as part of a scheduling agreement created when Notre Dame joined the conference in all sports except football. However, while this game may be mandated by the conference, it is not one of Florida State's eight conference games. • How much do key injuries matter? Ohio State could be the test case here. If the Buckeyes beat Wisconsin and win the Big Ten title with third-string quarterback Cardale Jones running the offense, how will the committee consider the fact that Ohio State broke in J.T. Barrett before Week 1 following Heisman Trophy hopeful Braxton Miller's preseason shoulder injury and then lost the record-shattering Barrett to a broken ankle on Saturday? In 2000 the NCAA men's basketball tournament selection committee dropped Cincinnati from a No. 1 seed to a No. 2 seed after Bearcats star Kenyon Martin broke his leg during the Conference USA tournament. That's fine in basketball, where the committee has 68 teams to slot. But in football a team loses the opportunity to play for a national title if it falls from No. 4 to No. 5. This committee may have to juggle that with regard to the Buckeyes. • How much does head-to-head come into play? TCU remains ahead of Baylor because committee members don't think the teams' résumés are close enough to make the head-to-head matchup the tiebreaker. That could change if Baylor beats 9-2 Kansas State on Saturday and claims the Big 12 title. How the committee handles that scenario could be fascinating. • How transparent will the committee be? The margin between No. 4 and No. 5 will probably be paper-thin. Will committee chair Jeff Long be willing to offer an in-depth explanation why No. 4 got in and No. 5 didn't? The problem for Long is there will be compelling arguments for both teams, and nothing he can say will satisfy people who believe No. 5 got the shaft. A week from now, speculation will be over. We'll know the playoff teams, and we'll know the bowl matchups. What happens between now and then is anyone's guess. The selection committee didn’t change the top four last week, but it will have no choice this Tuesday. I imagine the committee and I will agree to disagree on my pick for No. 4, but there is a chance we agree on the order of No. 1 and No. 2. The Ducks kept humming with a 47-19 win over Oregon State that was never in doubt. On Friday Oregon will have a chance to avenge its only loss when it faces Arizona in the Pac-12 championship in Santa Clara, Calif. The Ducks played again on Saturday without center Hroniss Grasu (knee), but they didn’t miss a beat with Hamani Stevens snapping to Marcus Mariota. The offensive line was ravaged by injury when Arizona beat the Ducks 31-24 in Eugene on Oct. 2, but that doesn’t tell the entire story. The Wildcats have proven through the remainder of the season that their win at Autzen Stadium wasn’t a fluke. If Oregon wins, the Ducks are in the playoff and probably headed to Pasadena for the semifinals. If Arizona wins, the Wildcats would be the first two-loss team considered for the field. The Crimson Tide scored 55 points and gained 539 yards in an Iron Bowl win over Auburn. Alabama also allowed 44 points and 630 yards in an Iron Bowl win over Auburn. SEC homers can knock off the whole “real football” critique with regard to teams such as Oregon, TCU and Baylor. Alabama can -- and occasionally must -- play the same kind of game those teams play. In fact, it may have to play another one against Missouri in Saturday’s SEC Championship Game in Atlanta. Things may look uglier with each passing week, but the Seminoles are the only remaining undefeated team in the FBS. Their biggest challenge could come on Saturday against Georgia Tech in the ACC title game. After three consecutive weeks of facing power-running foes (Miami, Boston College, Florida), Florida State now has one week to physically recover and prepare for an option opponent. Still, the Seminoles will be in the playoff if they win. I understand why the committee continues to rank TCU above the Bears, and I fully expect the committee will make TCU the No. 4 team this week. The rationale is that the Horned Frogs’ nonconference win over Minnesota is better than Baylor’s nonconference wins over three ham sandwiches, and that TCU’s loss (Baylor) is superior to Baylor’s loss (at 7-5 West Virginia). Here’s where I’m torn. While I would love to see a team punished for a terrible out-of-conference schedule -- as that would force teams to schedule better games for us to watch -- I don’t want it to happen at the expense of a head-to-head result. Baylor and TCU have the same record and play in the same league. They played a game. Baylor won 61-58. If we ignore the head-to-head in this situation, why even bother playing games at all? Just simulate them 100 times to get a more statistically significant result. Of course, this could be a moot point if the Bears lose to a very capable Kansas State on Saturday. Quarterback Bryce Petty suffered a concussion against Texas Tech, and Baylor nearly lost to one of the Big 12’s worst teams behind backup Seth Russell. 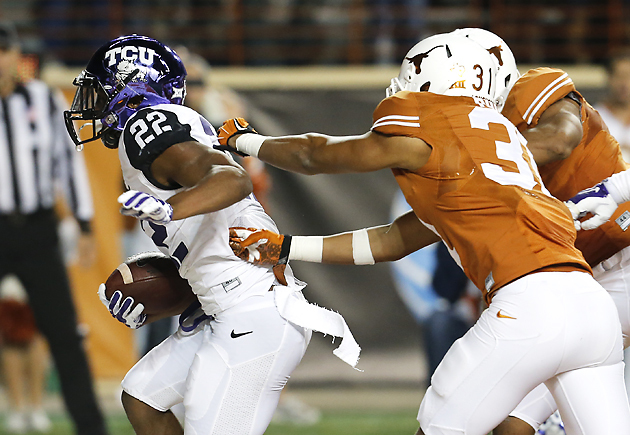 TCU already had its head-scratching scare (Kansas), so this is a push. But a Baylor loss would make the committee’s decision easy. A win would make it quite difficult, because while the Big 12 would recognize Baylor and TCU as co-champs, we’d all know which team really won because of the head-to-head. One of the signature moments of an Alabama game at Bryant-Denny Stadium is the playing of “Dixieland Delight,” a song by the band that shares a name with the state and the school. Here are the top seven bands named after places on a map. Trick plays often fail because they look too much like trick plays. Either their complicated machinations tip off the defense or a player asked to do something out of the ordinary -- a tailback throwing, a punter running -- looks too much like a player about to do something he normally doesn’t do. 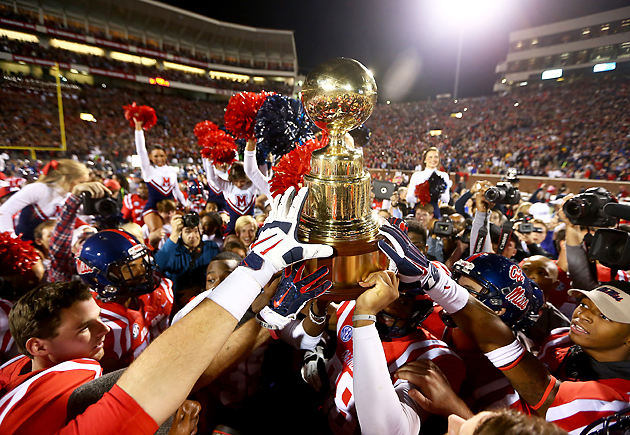 That’s why the trick play Ole Miss ran to effectively put Mississippi State away in the Egg Bowl was so perfect. The idea was a basic halfback pass. Fourth-string back Jordan Wilkins would take a toss from quarterback Bo Wallace, fake a sweep and throw to Cody Core down the right sideline. A lot of halfback passes get blown up because the back takes the ball and lingers in the backfield. In other words, he acts too much like a quarterback. Wilkins acted like a back, charging toward the line of scrimmage. The wide toss from Wallace suggested a trick play at first, but Wilkins’ sweep action quickly forced the Bulldogs to play the run. Then, as Wilkins approached the line of scrimmage, he tossed it over the defense to a wide-open Core. The score put the Rebels up 14 with 9:14 remaining and basically ended Mississippi State’s chances. The stat line rarely does Florida State defensive end Mario Edwards Jr. justice, but Saturday’s was an especially egregious misrepresentation of his impact on a 24-19 win over Florida. One solo tackle, two assists and a pass breakup. That’s it. What the stats don’t say: The Seminoles moved Edwards up and down the line to create mismatches that allowed the 300-pounder to wreak havoc. The only way the Gators could block Edwards was to hold him, and a few of those even got called and put Florida behind the chains. Without Edwards, we aren’t talking about undefeated Florida State right now. That’s why he’s the Big Ugly of the week. 1. Nebraska’s firing of Bo Pelini opens up an intriguing job. The Cornhuskers have a huge budget and great brand recognition, but Lincoln isn’t located near fertile recruiting grounds. A few schools -- Oregon, for example -- have managed to make this combination work, but success almost requires the kind of unique offense that allows this team to take “tweener” offensive players who might not be ideal fits at an Ohio State or Alabama or USC. That’s why I’ve long thought Nebraska should become a pure triple-option team again. This was a tremendous identity for the Cornhuskers when they were winning national titles in the 1990s, and it would make them incredibly tough to prepare for with no other Big Ten teams running that scheme. The option would eliminate the need to land big-time quarterback and offensive line recruits, because the ideal quarterbacks and offensive linemen for that scheme aren’t heavily recruited by other power-conference schools. (The quarterbacks are likely recruited as tailbacks or safeties.) The drawback is defensive coaches have to deal with rivals telling defensive line recruits that they’ll get cut-blocked every day in practice. (This usually isn’t true.) If Nebraska did decide to go retro and rebrand itself as an option school, there are some good options for a head coach. • Paul Johnson, Georgia Tech: Johnson has won with the option at Georgia Southern, Navy and Georgia Tech. His team will play Florida State for the ACC title on Saturday. • Troy Calhoun, Air Force: Calhoun doesn’t have to run the option. He has been in the NFL, and he ran a one-back, no-huddle offense at Wake Forest. But he has won with the option at Air Force, most recently knocking off officially sanctioned Hot Mid-Major Coach Jim McElwain’s Colorado State team on Friday. In fact, this combination of experience might make Calhoun the ideal candidate to craft a new-era option offense that utilizes the skills of today’s dual-threat quarterbacks. Or perhaps Johnson is already doing that. If Nebraska doesn’t want to party like it’s 1995, here are some more coaches who might fit well. • Dan Mullen, Mississippi State: He runs an offense that uses single-wing principles -- just like former boss Urban Meyer -- and he has excelled at finding diamonds in the rough on the recruiting trail. That second thing is the single most important job requirement for the next Nebraska coach. The biggest problem with this choice? Mullen might already have a better gig. • Pat Narduzzi, Michigan State: Some big-name program will be smart enough to hire the Spartans defensive coordinator eventually. The thing I just said about recruiting evaluation being the most important part of this job? Narduzzi might do it better than anyone. He’s also a great game-day caller of defenses who could restore the Blackshirts to their former glory. • Rich Rodriguez, Arizona: He invented the read option. He constantly finds diamonds in the rough. He’s a perfect fit. However, thanks to the unique way Arizona sweetened the pot financially during this offseason, he might be better off staying put. • Scott Frost, Oregon: The Ducks offensive coordinator played quarterback at Nebraska. He succeeded Chip Kelly as Oregon’s play-caller. That might be the ideal résumé Nebraska is seeking from a schematic and cultural standpoint. 2. Sometimes players disagree with the decision to fire a coach. Sometimes they throw a party when a coach gets fired. 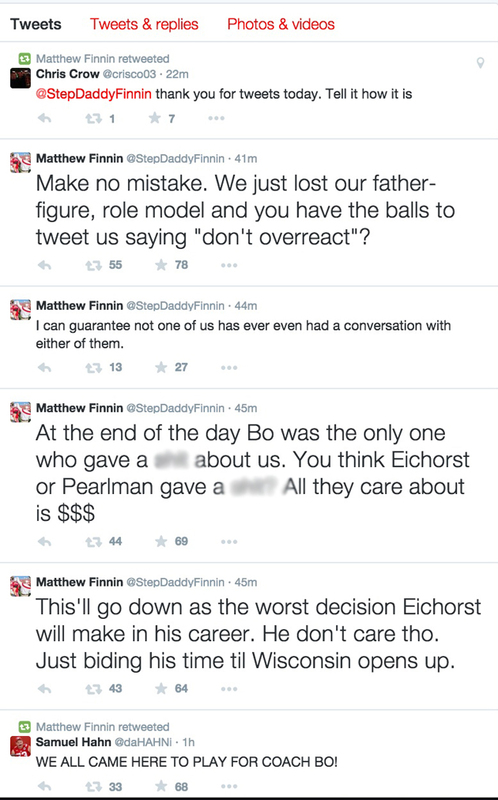 In the case of Pelini, the Cornhuskers were very upset with athletic director Shawn Eichorst’s choice. The most vocal was offensive tackle Matt Finnin. Playing college football is a great introduction to big business. Most players are afraid to acknowledge their awareness of this. Finnin is not. It turned about six more times, but the Yellow Jackets emerged victorious. Now they’ll try to win the ACC title on Saturday against Florida State in Charlotte. 4. Johnson wouldn’t have been nearly as happy if not for a bizarre decision by Georgia’s coaching staff to attempt to ice Butker on the game-tying kick. Icing the kicker isn’t an unusual move, but it’s highly unusual to call timeout when there are five seconds on the play clock and the opponent is out of timeouts with a field goal team that doesn’t look close to ready to snap the ball. The two most likely outcomes had coach Mark Richt not called timeout were a delay of game penalty -- and a 58-yard attempt -- or a hasty snap that could have either resulted in a missed kick or an illegal motion penalty because not all of the Georgia Tech players were set. Richt said on Saturday that he was “sick” about his choice of a squib kickoff that allowed Georgia Tech to get into field goal range in the first place, but that error was compounded by the timeout. The Bulldogs have been plagued all season by coaching errors -- such as not handing the ball to Todd Gurley on first-and-goal from the four-yard line in a loss at South Carolina on Sept. 13 -- and Nebraska’s firing of Pelini will only increase the pressure on athletic director Greg McGarity to reevaluate his program. Richt is safe this season. But this can’t continue next year, or Georgia’s leaders will have to consider a change. 5. Auburn safety Johnathan Ford told AL.com’s Brandon Marcello after Saturday’s 55-44 Iron Bowl loss that the Tigers defended Alabama receiver Amari Cooper “as any other person.” Here’s the problem: Cooper isn’t any other person. He’s the best receiver in college football. That’s why he nearly broke Ford’s ankles with a double move on a 39-yard touchdown in the third quarter, and that’s why he finished with 13 catches for 224 yards and three touchdowns. That performance -- and the coaching that inspired the Tigers to bring that attitude into the Iron Bowl without the ability or scheme to back it up -- is part of the reason why the Tigers parted ways with defensive coordinator Ellis Johnson on Sunday. 6. Johnson's firing opens another plum, high-paying defensive coordinator job in an offseason when some accomplished defensive coaches are available. Texas A&M fired Mark Snyder on Friday, and Lorenzo Ward’s job could be in jeopardy at South Carolina. If a school hires Narduzzi, another great job would open. Meanwhile, Will Muschamp on the market. So is Pelini. Greg Mattison is probably about to be out of a job at Michigan. If Frank Beamer steps down at Virginia Tech, Bud Foster would become available if he isn’t tabbed as Beamer’s successor. The defensive coordinator market this offseason might be even more interesting than the head coaching market, and that’s saying a lot. 7. Ohio State quarterback Barrett’s injury has obvious immediate effects, but it also could have an interesting long-term effect. Buckeyes coach Urban Meyer said on Saturday that Barrett will “be able to function in spring ball,” though he might be limited in the running game. Remember, Ohio State also gets Braxton Miller (shoulder) back following his rehab. Until Saturday, it appeared Miller was in danger of getting Wally Pipped by Barrett, but this may change the equation a bit. So, what does Miller do? He’s on track to graduate in December. He could transfer anywhere and play right away, and there would be no shortage of schools interested in a two-time Big Ten offensive player of the year. But he also may be able to win his starting job back at Ohio State and give Barrett a chance to fully rehab his ankle before he continues demolishing Ohio State’s program records in 2016. It’s a fascinating situation with no easy answers. 9. Never change, Art Briles. Baylor’s coach means that people with nothing to lose are far more dangerous than people with a lot to lose, but the lesson is that no one really wants to fight Briles -- who might be the top seed in the fictional college football coach cage-match fighting rankings since Ed Orgeron is still without a gig. Briles has bigger problems than his hypothetical homeless fist-fighter, though. Quarterback Petty has a concussion, and the Bears need to beat Kansas State on Saturday to keep their playoff hopes alive. It’s unclear whether Petty will be ready to play or whether backup Russell will get the start, but it is clear that the concussion has not affected Petty’s sense of humor. 10. So long, Devin Gardner. Wish things had turned out better on the field, but you’ll be just fine. The trailer for Star Wars: Episode VII dropped on Friday, and the coolest part was an image of some nascent Sith firing up a lightsaber in the shape of a medieval broad sword. I was stunned to find some of my fellow geeks ripping this development as an example of J.J. Abrams taking too many liberties with the franchise. Just as with Darth Maul's lightsaber staff in Episode I, this is a blatant attempt to sell toys. I understand that. But I'm OK with it if it eliminates the desire to create more Ewoks or another Jar Jar Binks. Those were also blatant attempts to sell toys. At least this one can chop off someone's hand. One of the (very) few drawbacks of the world’s greatest job is I almost always have to leave home immediately after Thanksgiving. This means I miss the ultimate day of channel-surfing through football games while devouring comfort-food leftovers on my couch. On Friday morning I left a fridge full of turkey, pulled pork, macaroni and cheese and sweet potato casserole to catch a flight to cover the Iron Bowl. Normally, I want to try something new each week so I have something to write about in this column. When I landed in Birmingham I just wanted comfort food. For food to comfort me, it must take me back there. And if I haven’t tried it yet, then I don’t know if I’ll get to chase that particular dragon for a few glorious minutes. 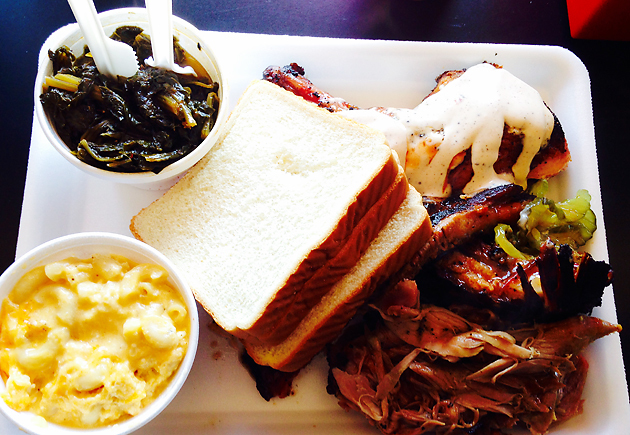 That’s why I drove to Homewood, Ala., walked into Saw’s BBQ and ordered the Saw’s sampler on Friday afternoon. I’ve eaten there close to a dozen times in the past three years because Saw’s is one of the nation’s great barbecue joints. I know the ribs will always be juicy and come off the bone with just a slight tug. I know the pulled pork will always be juicy and won’t need sauce. I know the chicken will always be smoked perfectly and kissed with the white barbecue sauce that I love in spite of my lifelong hatred of mayonnaise and mayo-based products. I know the greens will always be spicy and sweet at the same time, just like the turnip greens my grandmother would cook after I helped her collect the turnips from the garden. Nothing about that Friday lunch surprised me, but it did take me back to a place where I felt full, happy and safe. That’s the best we can hope for from any meal.